An easy, healthy breakfast bowl! Amaranth-oat granola, almond milk and fresh blueberries. Vegan & gluten free. Let me start out by saying: I’m not a cereal person. I’ve told this story before – my sister and I used to BEG my mom for all of the artificially colored sugary cereals with fun cartoon characters… sometimes she’d give in but always with the disclaimer “only if you actually eat it this time.” We would excitedly make this promise only to go home, have one bowl and never touch it again. This granola, however – I’ll happily eat cereal-style. But with almond milk instead of regular milk because we all know that Almond Breeze is my go-to milk. 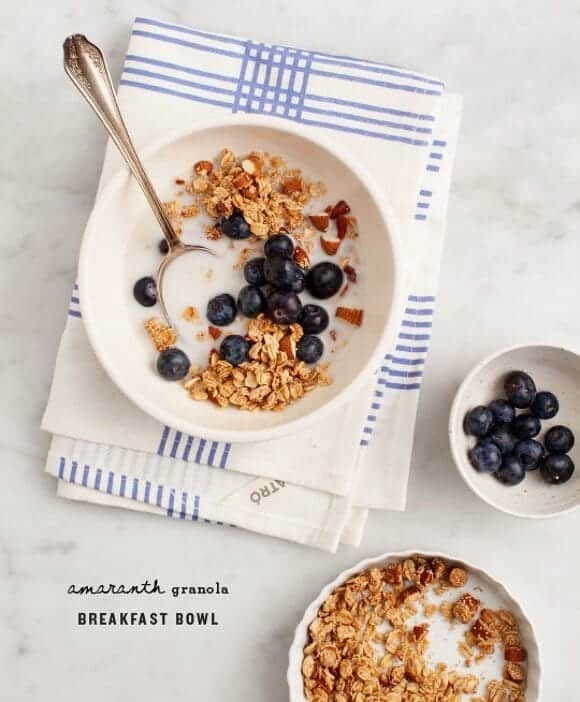 Amaranth is a new grain for me – you can google for it’s health benefits (i.e, just like quinoa, it’s a good source of plant-based protein), but I love it in this granola because it’s crunchy texture really holds up when it gets doused with almond milk and fruit. Soggy cereal is just not acceptable in my book (or, well, on my blog). What I love about this breakfast is that it’s hearty and satisfying but also convenient for those days when you need a breakfast on the go. 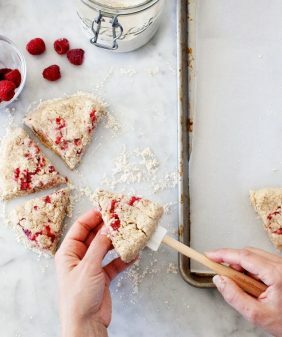 Make a big batch and keep it at your desk… or better yet, portion it out so to avoid snacky temptation because it’s so delicious and addictive! Preheat the oven to 300°F and line a baking sheet with parchment paper. In a medium bowl, mix together the oats, amaranth, almonds, cinnamon and salt. Add coconut oil, maple syrup and almond butter, and mix to incorporate. Spread onto the baking sheet and bake for 15 minutes. Rotate the pan in the oven and bake for 15 minutes more, or until golden brown. Let cool for 15 minutes before serving. 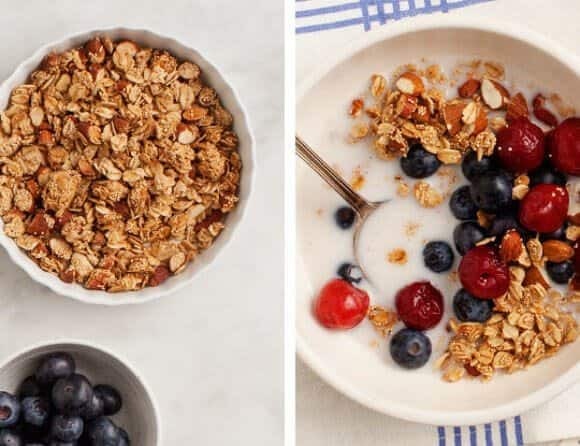 Assemble bowls with granola, fruit and almond milk. Store extra granola in an airtight container. *If you're gluten free be sure to find oats that are certified gluten free. great recipe as usual. Just a question: do you use popped amaranth or plain uncooked amaranth? Hi Cristina, I used them plain and uncooked. Spent the morning preparing this, put it in oven at 300 degrees as advised and burnt the entire thing to a cinder after 20 mins. Thanks for nothing. I’m sorry, maybe your oven runs hotter than mine. I LOVE amaranth and granola. This looks delicious. Definitely trying this out this weekend! This looks so good! I think I need a granola fix! I’ve never tried amaranth before, but I think it is high time I start! Thanks for another great recipe! I love Amaranth. It’s one of my favourite grains for breakfast, either as a porridge or in granola and in granola bars. It’s so versatile that I’ve also used it in soups, to thicken them. I actually recently posted an Amaranth granola too, with tahini and orange blossom, but I used the popped Amaranth. I’m curious to see how adding it raw works. Does it pop in the oven? I hadn’t heard of popping it before (I”ll have to try it now though!). It cooks in the oven – it’s a little crunchy still but we really liked how it stayed crispy with the almond milk and fruit (the granola didn’t get mushy). I love granola, so this one is definitely a keeper! I haven’t tried amaranth before, I look forward to this new grain. Thank you for consistently providing new ideas. Now that my blog is a little more established, I would love it if you could have a look! Thanks for sharing this recipe with us. We love seeing when amaranth is being used as an ingredient and are promoting the health and environmental benefits of it. Take a look at our recent press release. 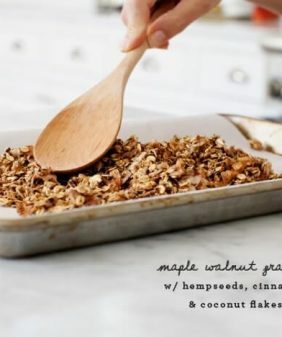 I am inspired to make some granola! Oats are quite healthy with their soluble oat fiber (beta glucan). 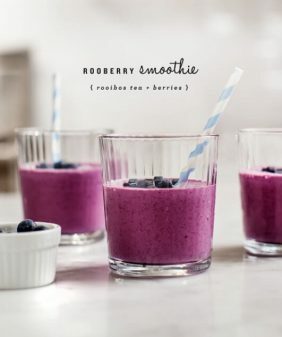 Combined with whole grain amaranth and almonds (and Almond Breeze! )…what a nutritious breakfast concept! This looks like a heavenly breakfast! I really enjoy amaranth, but don’t use it nearly enough. I kind of forget about it for long periods of time (food blogger problems!). Thanks for the inspiration! Have a great weekend! This is an excellent recipe, thank you for sharing,! I was wondering how it would taste. I made this recipe over the weekend and it was great! I made a parfait using the peanut butter mousse (recipe below) + blueberries 🙂 I liked that the granola held its crunch. Mmmh, those fresh blueberries are to die for! This is the most beautiful and delicious breakfast I could ever have! I’m not a big cereal person either, but I do love me some good granola, especially when I make it myself. I’ve been experimenting with my granola recipes lately, but haven’t tried amaranth yet, can’t wait to give this a go. Thanks for the inspiration! I made this last night and I love the wonderful crunch the amaranth gives the granola! I’ve never thought about adding amaranth to granola before and I think I’ll be doing it more often. I had a quick question — is 1 teaspoon the correct amount of salt called for? I found the granola a tad too salty so it was more savory than sweet– or maybe that’s just my palate! Hi! 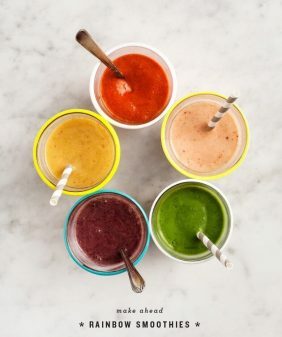 I just created a blog about healthy living with my friend. The two of us are completely new to this so any reply at all would help. We were wondering if you would check our blog out. Our blog is freshlychoppedgreens.wordpress.com. Thank you so much, your blog is inspiring! thanks for the post and good luck. Good idea for breakfast ! Be the change that you want to see in this World! 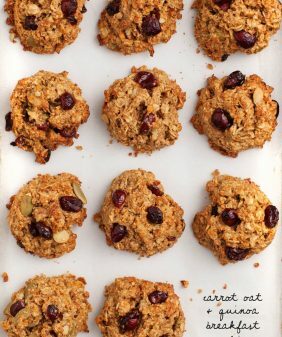 I love how simple this is 🙂 This recipe leaves no excuse to eat store-bought, sugar-laden granola! Hi!! Just wondering how long I can store this granola, looks amazeballs!!! hmm, ours doesn’t last more than a few days so I’m not exactly sure :). I’d say 5 days, maybe 1 week? If I make this in batches, what would the shelf life be? 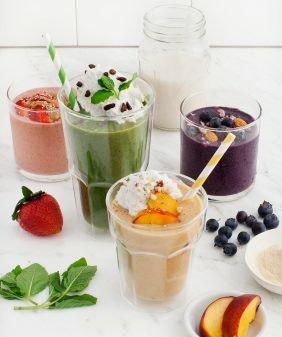 Would you suggest using yogurt in place of almond milk? The black mess I ended up with after baking this at 300 degrees as stated in the recipe was inedible. What is this, a practical joke? This looks lovely, very keen to give it a try as soon as possible! I’m trying to get more iron lately so like sweetening with blackstrap molasses, I know it’s quite thick and sticky but I’ll see if it works and comment back. Just a suggestion: after reading through the comments I saw a couple of people say theirs burnt to a crisp. Might be a good idea to specify whether you are setting your oven to Fahrenheit or Celsius. I always think in Celsius (which would be maxing out the heat of the oven!) and perhaps the others did too. Thanks Rebecca! This is an older recipe, I’ll go fix up!